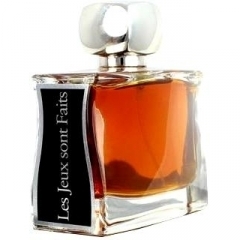 Les Jeux sont Faits is a popular perfume by Jovoy for men and was released in 2013. The scent is spicy-woody. It is still in production. Les Jeux sont Faits opens with a very green and slightly peppery angelica before cumin from its heart starts so peek through early. As the fragrance enters its early heart phase the angelica remains but now in subdued form, as the cumin spice takes on the starring role in a big way supported by an almost cognac-laced leathery accord. As the fragrance enters the late dry-down the earlier notes and accords all but disappear, as the fragrance turns soft and powdery, primarily driven by powdery vanilla, relatively sweet sandalwood and patchouli from the base. Projection is average and longevity is on the low side of average at 6-8 hours on skin. Les Jeux sont Faits is my first introduction to the house of Jovoy, and things are off to a pretty good start. It opens a bit like Angeliques Sous La Pluie with its angelica focus, but it quickly morphs into its primary cumin driven leather accord in the heart notes, reminding me more than a bit of Puredistance M. Finally, as it dries down the fragrance changes once more, now into a powdery slightly sweet mix that somehow seems a bit detached from the rest of the composition before it disappears just a bit too quickly. The first and second stages are by far the best parts of Les Jeux sont Faits to my taste, as they channel two excellent fragrances already in my collection (though neither executed as well as the originals); and then the game is up as in the late dry-down the composition loses its way and tries to be something else. I can certainly say that on the whole the composition is a success, but whether this very good 3.5 star out of 5 rated effort merits purchase at its relatively lofty $180 per bottle price tag is another story. I would stick to the fragrances it tries and largely succeeds at emulating personally. Write the first Review for Les Jeux sont Faits!